House Plumbing System can be divided into three parts: a water supply system, fixtures and appliances, and a drain system. Water supply systems are of two types: Direct Water supply system and Indirect Water Supply System. Storage tanks are an integral part of an Indirect Water Supply System. In indirect water supply system, water is not supplied continuously (i.e water is supplied only for few hours in a day). Hence, it becomes necessary to store water to carry out various activities throughout the day. 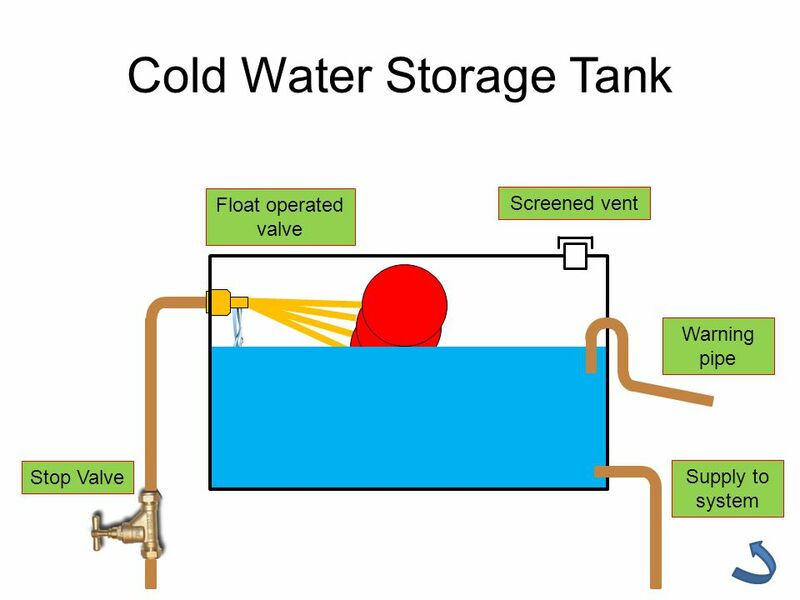 Storage tanks store water to meet water needs daily and even during repair works of mains, fire fighting and water cut offs. Overhead water tank also known as elevated water tank is located on terrace of the house or residential building for supplying water to the entire house. It is filled either with mains supply or from underground water tank. Water flows under gravity from it as water tank is at height of the building. These tanks are built/placed under ground. Water is filled into these tanks from mains. Water in it is pumped to fill overhead tank or is pumped directly to the floors. It is a secondary water storage tank. These tanks are built (R.C.C water tank) or placed (Plastic water tank) on ground or floor of any building. They are used in emergency when overhead and underground water tanks are empty. They are strong and long lasting. Usually overhead water tank is made up of RCC. Even underground water tanks can be of RCC. Underground tanks are usually masonry tanks. They are strong and light in weight. These are portable tanks. It can be used as overhead tank, underground tank as well as tank resting on ground. They are made of PVC and already available in markets. They are very stiff and rigid but relatively thin and light in weight. They are made of galvanized steel with a zinc coating to protect steel from corrosion. Inlet(s), outlet(s), drain, overflow and vent(s) (with insects screen), level indicator, manhole, sump, drain pump and free board of 200m to 300m for installation of float valve. The location of inlet should be at the top so that maximum water can be stored. Outlet should be at the bottom of the tank so that maximum water can be used and it is also necessary for circulation of water (i.e between water already in tank and water entering tank). Water circulation maintains the level of residual chlorine. Out let should be 10-15cm (about 4-6 inches) above bottom because impurities settle at the bottom of the tank and they may flow with water if outlet is at the very bottom of the tank. It is located at bottom of the tank to empty the tank as well as to remove/clean sediment deposits during cleaning of tank. It is located at the top of the tank so that more water is not stored in the tank. It is provided for allowance of freeboard. Freeboard is necessary to maintain the air gap. Else tank may burst due to water pressure. Generally it is at inlet level. Vent pipes are located at the top of the tank to release air. At the time of refilling water in tank air is removed out through vent pipes. Opening of vent pipes should face downwards to prevent entry of contaminants and debris into tank water. It is a dipstick (graduated rod) that indicates the level or quantity of water stored. Manhole is an opening into tank top for inspection, maintenance, and cleaning. It is simply an opening in the top of the tank with a lid which can be locked. Minimum size of manhole opening should be 560mm dia or 600 x 600mm for a person to enter into it for cleaning and maintenance. It is situated at the base of the tank for draining purpose. Additional sump is required for installation of submersible pumps in case of underground or on ground water storage tanks.